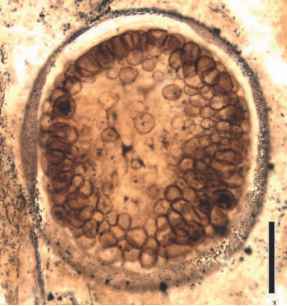 FIGURE 3.5 Zoosporangium with discharge opening found in phloem cells of a Carboniferous fern. Bar = 20 |im. 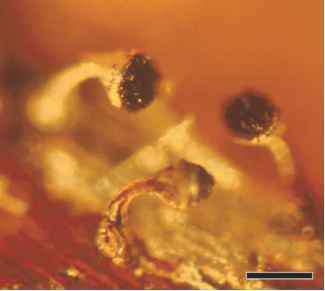 FIGURE 3.6 Tracheid from Sphenophyllum containing fungi (Pennsylvanian). Bar = 500|im. 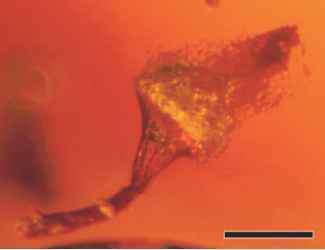 FIGURE 3.7 Chlamydsospore with chytrids on the surface (Devonian). Bar = 300 |im. 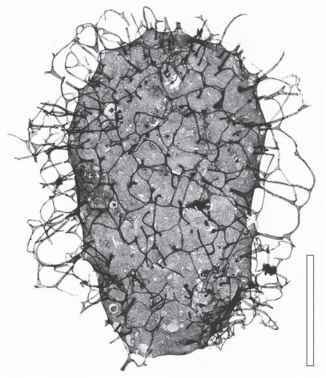 FIGURE 3.8 Cortical cell filled with fungal hyphae (Pennsylvanian). Bar = 10|im. these estimates. Based on these calibrations it is suggested that fungi may have diverged from metazoans about 1.5 Ga (Hedges et al., 2004; Taylor and Berbee, 2006). If these estimates are even close to being accurate, then it would be expected that more fossil fungal remains will be described from these ancient sediments in the years ahead. 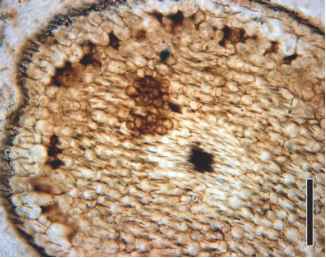 FIGURE 3.12 Section of Aglaophyton major axis with two clusters of fungal spores (Devonian). Bar = 300 pm. 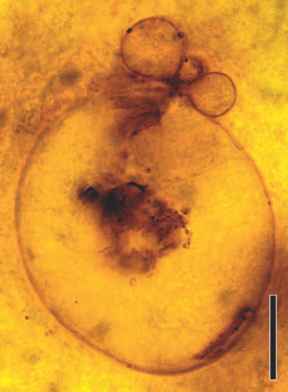 FIGURE 3.14 Palaeomyces sp. 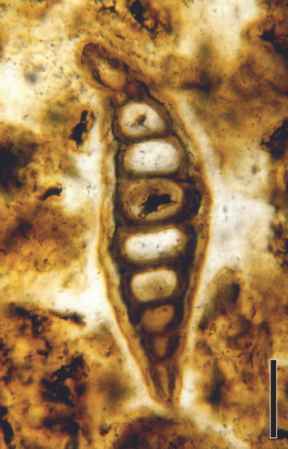 spores within large resting spore (Devonian). Bar = 75 pm. 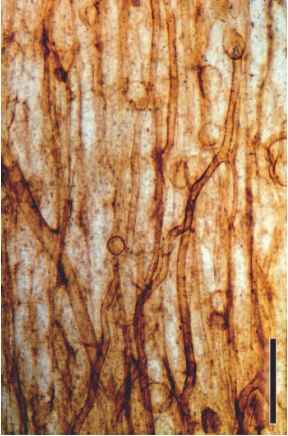 FIGURE 3.13 Hyphae and chlamydospores in Rhynie chert plant tissue (Devonian). Bar = 120 pm. Palaeoblastocladia (Remy et al., 1994), and Glomites (Taylor et al., 1995), are but a few of the morphotaxa known from the Rhynie chert ecosystem. These are described later in the sections "Glomeromycota" and "Chytridiomycota" (Palaeoblastocladia ). 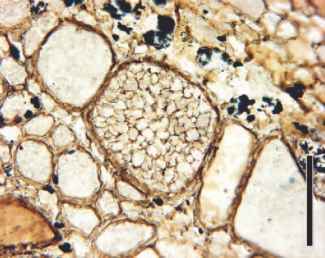 Other fungi in the Rhynie chert cannot yet be assigned to major groups. 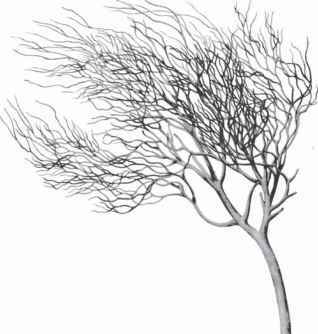 They consist of non-septate hyphae that branch at irregular intervals, as well as hyphae that are distinctly septate, with the central region of the septum slightly thickened (Kidston and Lang, 1921a). 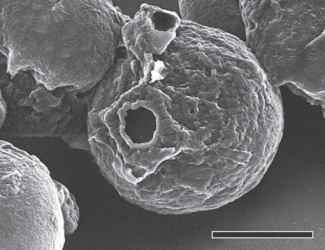 At various points along the hyphae, ovoid to pear-shaped vesicles occur which are believed to have developed into large (250 pm), thick-walled sporangia. 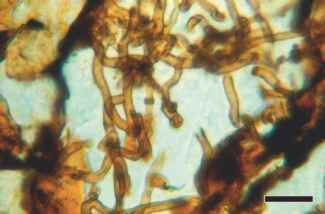 In other thin-section preparations, especially those of the chert matrix, larger sporangia occur, but these have not been found attached to hyphae. Those with stratified walls were named Palaeomyces gordonii var. major and are now thought to be members of the Glomeromycota (discussed later). Other sporangia contained a variety of thick-walled structures termed resting spores or resting sporangia. There is no doubt that several different natural forms are represented by these Rhynie chert fungi, but they cannot yet be assigned to a particular clade with certainty, as important parts of their life cycles have not yet been discovered. Recent work indicates that there is not only a considerable diversity of fungi within the Rhynie chert but also that these specimens offer the opportunity to examine the life history of some of these early terrestrial microorganisms as well as their biological interactions with other components of the ecosystem. know that R. gwynne-vaughanii and A. major are not only different organisms, but probably belong to different clades. Fungal spores represent one of the most common examples of fungi in the fossil record, and are found in a variety of facies from the Paleozoic (Pirozynski, 1976a; Ediger and Alisan, 1989) to the recent (see section "Fungal Spores" t . The identification of fungal palynomorphs (FIG. 3.15) is difficult, but there are now several glossaries of descriptive terms relating to spore and thallus morphology and structure (Elsik et al., 1983; Kalgutkar and Jansonius, 2000).